﻿What to wear for Pongal? Ear-Nose-Throat (ENT) Specialists in What to wear for Pongal? The famous festive of South India -Pongal is ready to rejoice every one with delightful moments and amazing rituals that traditionally drive our culture. If it is festive time; we always plan what to wear may be a month ago. Some are really excited to go for the last-minute shopping that really makes them run for purchasing the preferred garments. There are diverse options spread out, but know the festival’s highlight and then opt for the attire that perfectly goes with it. It’s Pongal, a traditional fete, better go for attires that welcome out Tamil tradition and culture. Women can be named as the ‘blessed people on earth’, though they spend hours together for filling their shopping cart; they have diverse varieties for choosing. For this Pongal traditional winds pass swift in women’s mind and so many sarees boutiques are flocked with special offers and discounts. What to choose among them? Here is a list that will excite you gals! Banarasi is always best and prominent during the wedding season. You can also choose this saree for festive occasions as it is adorned with delicate embroidery work that adds beauty to the saree. It often uses multi-colored thread work and the pallu is often laced with pure silver and gold thread and thus making it the costliest one to buy. Newly married, this Pongal, glitter like a goddess along with your partner! 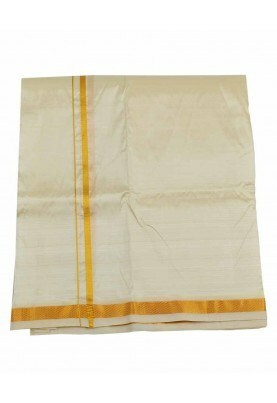 In Tamil Nadu, the famous city for selling sarees is Kanchipuram and is prominent for silk sarees. It is the best suited one for special occasions and festive seasons. 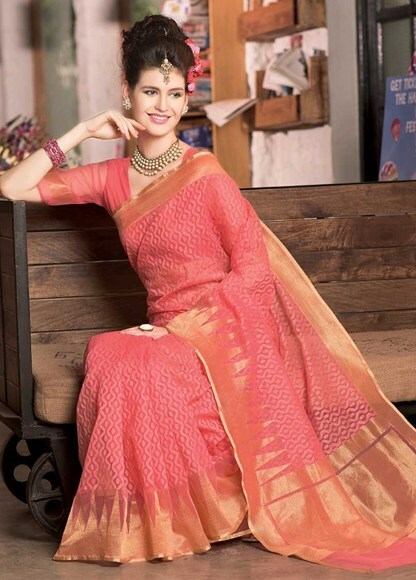 These hand loomed sarees carry beautiful art work on woven with pure cotton threads. The embroidery carries amazing designs and if you are looking for an affordable one then go for Kanchipuram silk sarees. If you are looking for some other designs for this Pongal, then you can also go for Chanderi sarees, Munga sarees, Sambhalpuri Sarees and Baluchari sarees. Often, men can also be named as ‘wonderful people on earth’ because they are the ones who shop within an hour. All they need is just a shirt and a pant. But for Pongal, this modern and fashionable garment for men doesn’t suit. So, going in for tradition attires will be best on them. The Dhoti (Classy by tradition) – Especially men in Tamil Nadu wear this traditional outfit during any auspicious occasion or festivals. It is made of pure cotton and defines style and elegance to men. They can wear some matching color shirts and when they walk on the roads, no women will cross you with a glimpse. They usually prefer to wear Angavastram along with this to give the attire a complete look. It’s time for Pongal! Get your wallets filled and start out the shopping in nearby Boutiques and glow like never before! Advance Pongal wishes to all! Looking for Ear-Nose-Throat (ENT) Specialists?